The study, Building a Bridge into Preschool in Remote Northern Territory Communities, looked at the Families as First Teacher program which uses the Abecedarian Approach of family-led learning through conversational reading and learning games in first language. The research aims to bring together cultural knowledge and evidence-based early learning to improve educational outcomes in young Aboriginal children. It is being led by the Melbourne Graduate School of Education at the University of Melbourne in collaboration with the Department of Education’s Early Childhood Education and Care. Maningrida and Galiwin’ku have two of the Territory’s largest remote Families as First Teachers (FaFT) programs and they each held ceremonies in May to celebrate their participation in the study. More than 120 community members came together at Maningrida for the celebrations, representing more than eight language groups. At Galiwin’ku, more than 200 community members participated in the ceremony. Family Liaison Officer Dorothy Gapany said FaFT was strongly supported by her community. “I engage with kids aged 0-3 and work with mums and encourage mums that they are the first teachers for their own children,’’ she said. Ms Gapany said FaFT employed seven local Indigenous people and the strength of the program was in its use of language and culture to teach mums and babies. “It’s learning in two ways. 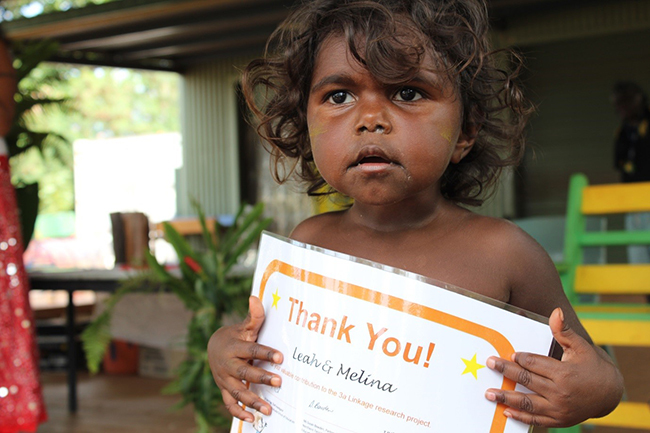 Yolngu and Balanda language are part of the program and this is what makes it effective learning. “We encourage mums that if you don’t know how to read and write just go along with the pictures, and mums have that courage and confidence to be able to work with their children.